Because it is Tuesday and I'm a day late posting! Because yesterday (and today) we had sun!!! Yes, real life, warm, glorious sun! So that meant a mad rush to sort out the garden: take out old crops, put in new, sort out seed trays, buy compost to fill the raised beds which are not raised at the moment..realising we don't have enough money to fill raised beds, so filled containers instead and re-planned the whole planting strategy for this year. Seriously, you spend all winter with nothing to do and then spring comes and it is a mad rush to plant, plant and plant some more! I love it! My back is killing me but my mind and heart are as happy as a child in a sandbox. Lovely. Not a lot to show regarding the garden because I doubt you would get as excited as I am with bare soil but I do have a couple of things which actually, are quite worrying really, but I digress. Let's not worry about climate change and just enjoy the beauty instead! 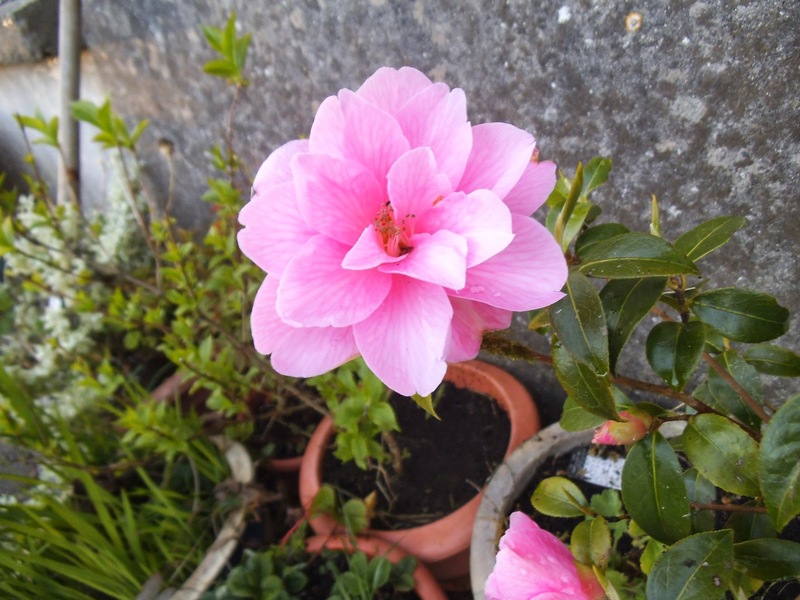 My beautiful Camellia which was a gift from a friend. How beautiful! 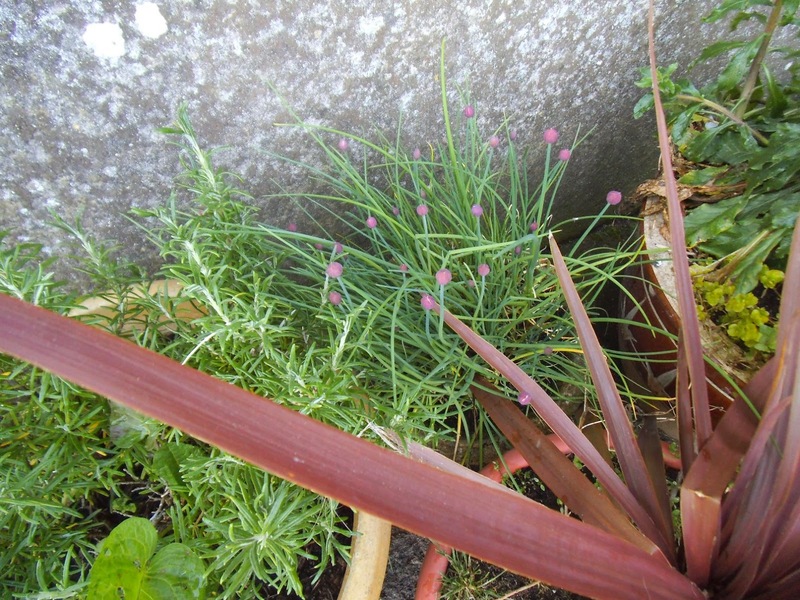 If you look at the back you can see my chives coming into flower! 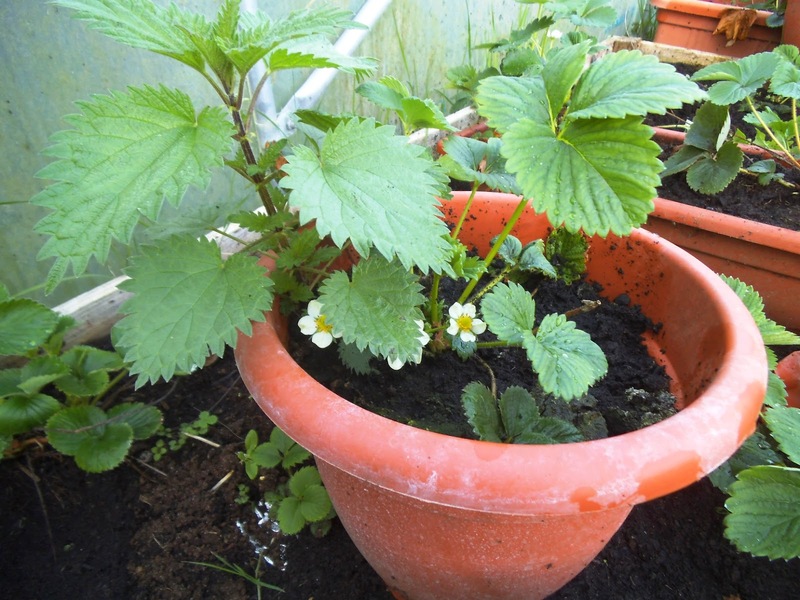 And yes, even my strawberries are coming into flower! So, apart from planting and digging and doing disgusting things with chicken pooh (aka fertilizer) did I manage any crafts? Well, yes I did! Yay!! First up, the magnificent Maggee sent me some fabric to raise funds for cancer research. 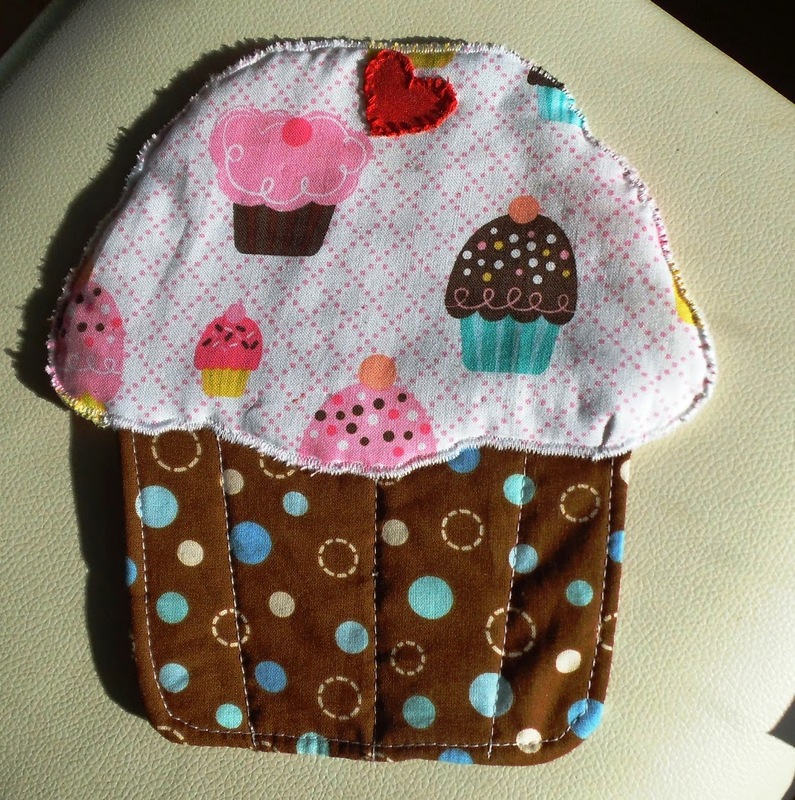 I knew this material was destined for great things...so I made a cupcake mug rug to match the cupcake theme! How cute is that? And you 'overbind' the icing fabric so that meant I had to come out of my comfort 'anti-sewing' zone and use a second stitch style on my sewing machine. Good grief..not one but two stitches??? There will be no stopping me now! I am going to make some more of these and they will find their way into my prize draw pile. It just seemed the most appropriate use of cupcake fabric! As I was delving through my fabric, I found some squares and scraps of vintage style fabric so I had a play. 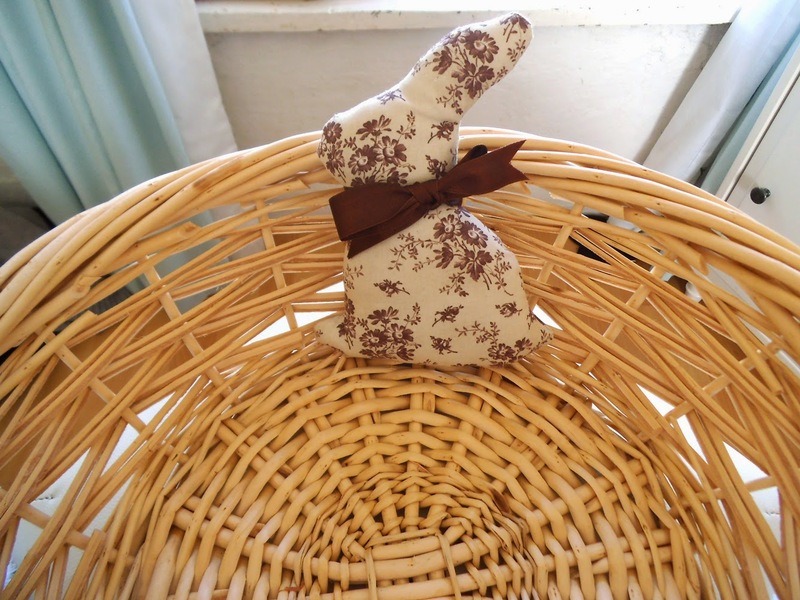 I decided to make a Holmsey hare pin cushion. Not the easiest thing as there are no hare templates so I free-hand drew one which looks a little like a bunny but you say tomAto and I say tom-ar-to. Sweet but lonely, so I made him a wife. And they got along very well! In fact they got along very well indeed! A little bit too well! Sigh..I think I am going to have seperate them! 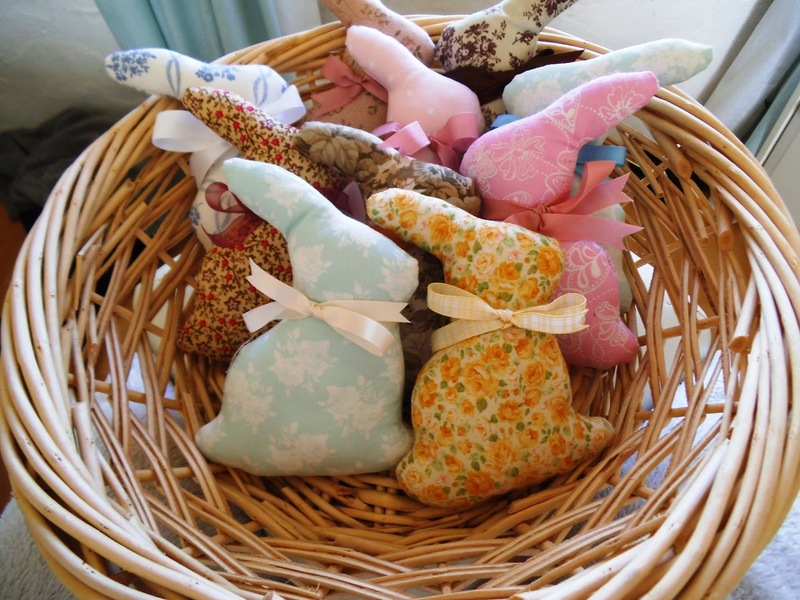 Not too sure what I am going to do with all these little pincushions..but they were fun to make! 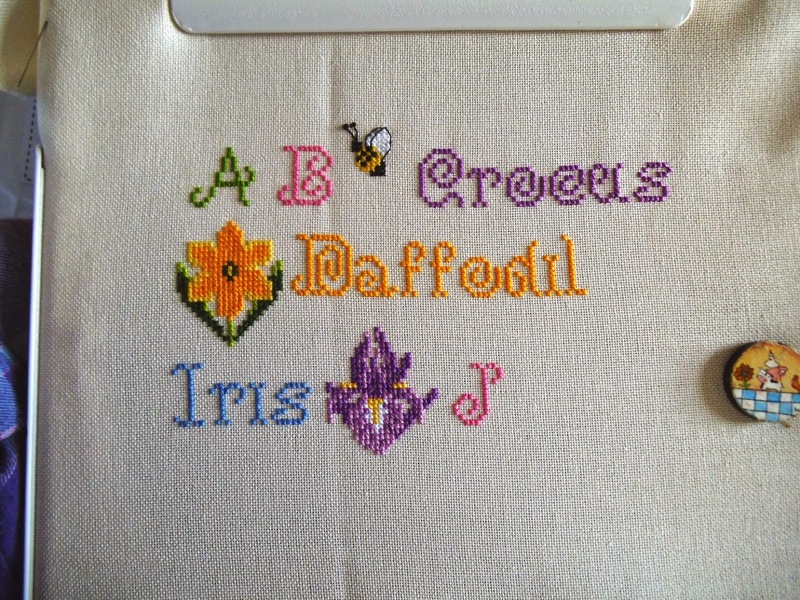 On the stitching front I have got a little further along with my Spring ABC. I need to do the back stitch and I'm hoping to finish it this week...not today though because it is still sunny!!! Yay!!! The fabric is actually a lovely warm cream colour and this is turning into a really fun stitch! 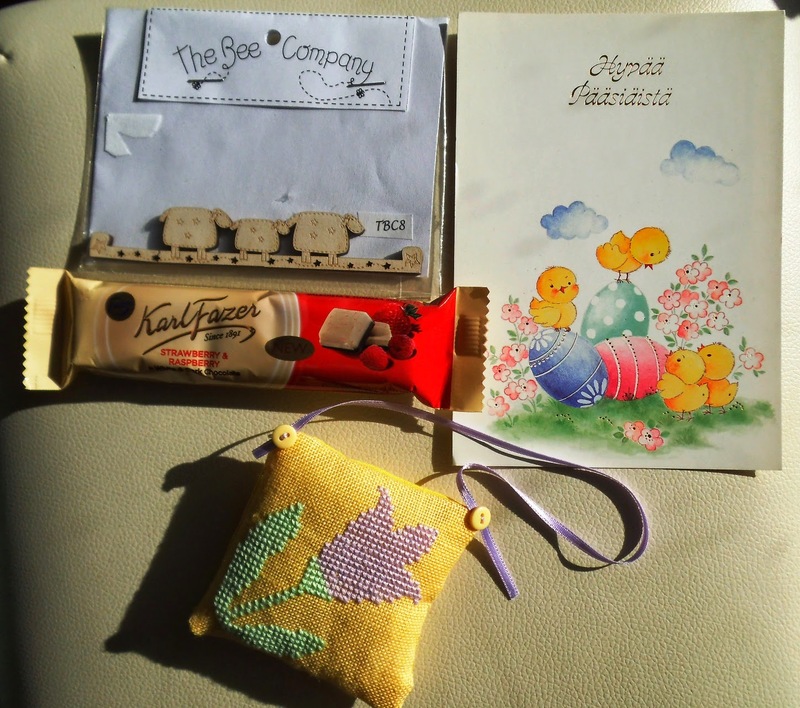 On a final note, I would like to thank Tarja for my lovely spring exchange gifts! We exchange through a yahoo group called x-stitch monthly, though it is now open to all fabric crafts. The exchanges are great fun! I love the little pillow..it is really cute! Now the very last thing I want to write about today is blogging over fb. I have noticed a lot of bloggers moving over there and it is a real shame. I have a fb page as well but I love my blog. You can find things, you know people are seeing your posts whereas with fb, they change the goalposts so often it is shifting from (in my opinion) a social networking site to a social-if you are lucky you will see my posts-site. Also, I had a lovely email and a comment on a blog from a lovely lady thanking me and another blogger for our advice and inspiration which led to her experimenting with her lovely cross stitch finishes. And they turned out beautifully. I had to laugh really. I'm sure those of you who have been reading my blog for the 4-5 years I've been around will remember my own fears and intrepidation into the world of sewing. I'm far from expert but I have learned to relax and have fun which is what it is all about really, and that in turn is thanks to other bloggers too numerous to name but you all know who you are inspiring and advising and helping in many ways. You simply cannot get that kind of support or friendship on fb just because of how it runs. So please, by all means get a fb page and post away, but don't abandon your blogs completely. They were so important to me when I was ill: I read the and dreamed about what I could stitch or make when I got my numb fingers back to normal and they all gave me hope when the tunnel became so dark I couldn't see the light at the end. And I gained inspiration just as this lovely lady has gained inspiration which allowed us both to come out of our comfort zones and develop our crafty talents further. Oh I love your post today! Made me giggle and giggle.. your bunnies are very cute and I need to make me one too!! Is it your design? I love your blog and fb page, I have been given so many tips and bits of advice from you its lovely and kind of you to do that. Yes the sun is out here too!! Washing is top of my list! How nice for it to blow in the sunshine! Awww... those bunnies are so sweet and I loved seeing your signs of spring since we are having snow here today! Oh those bunnies make me laugh. Bunnies multiply, for sure! lol. Isn't it wonderful to see spring and everything coming out again? It's like greeting old friends. I'm not on FB. I know I miss certain things like joining groups. So I will just keep my little blog chugging along. Glad to have you stick around too! I agree with you on blogging vs. Facebook, their just not the same. Glad to hear you got some sunshine and time in your garden, I love days when I get my hands in the dirt. No interest in FB at all for me, I like my blog... and yours too. 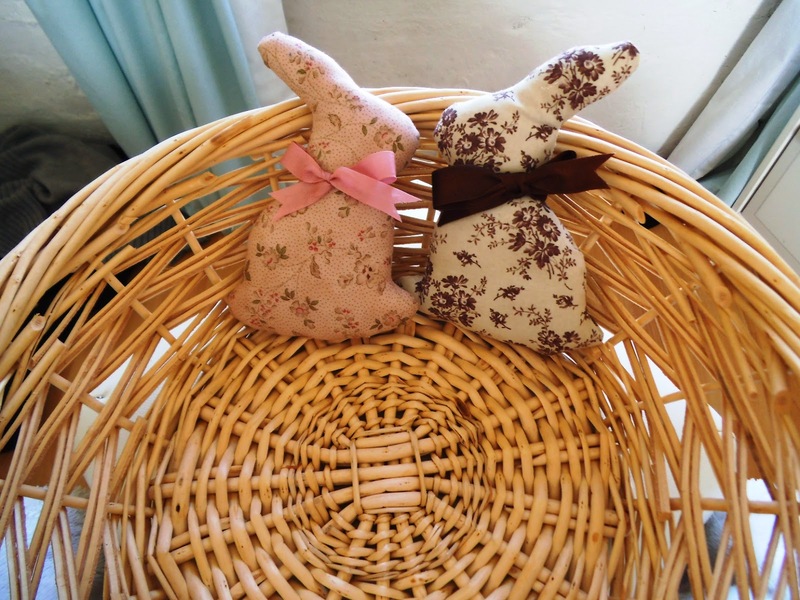 Your Holmsey bunny's are lovely, reminds me of a very similar one that our dear friend Cathy (aka Pumpkin) made for me, its lilac in colour and so lovely and very special to me. Nice stitching and sewing. Enjoy the sunshine, get lots of Vit D!!! Oh my, what a chatty post this is. And you have been so busy with gardening, stitching and sewing. 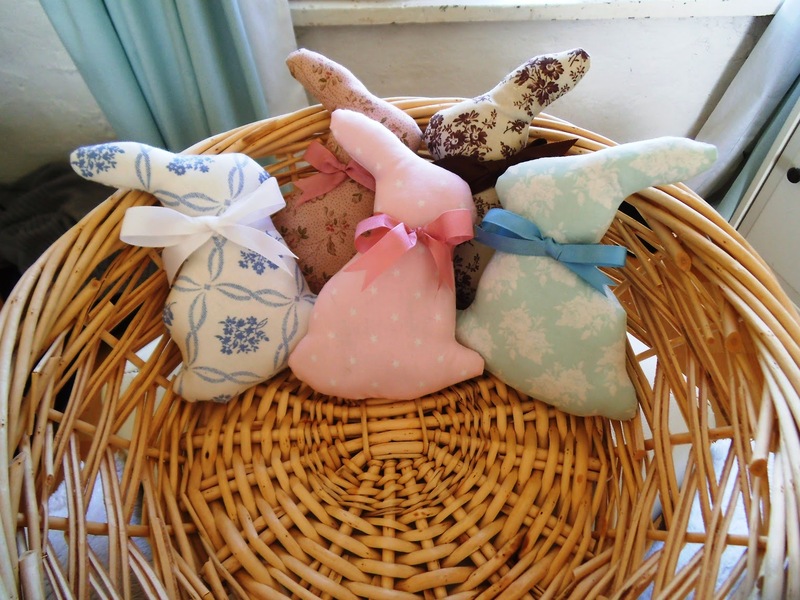 I love love love all your bunnies, they are so sweet with all the different fabrics and ribbons. I have realized too that some have abandonned their blogs in favour of fb. I'm not on fb and don' have the intention to go there in spite of all the groups and freebies that you can find only there.But I just love blogging and visiting other stitchers' blogs and see what they are working on. What wonderful photos. 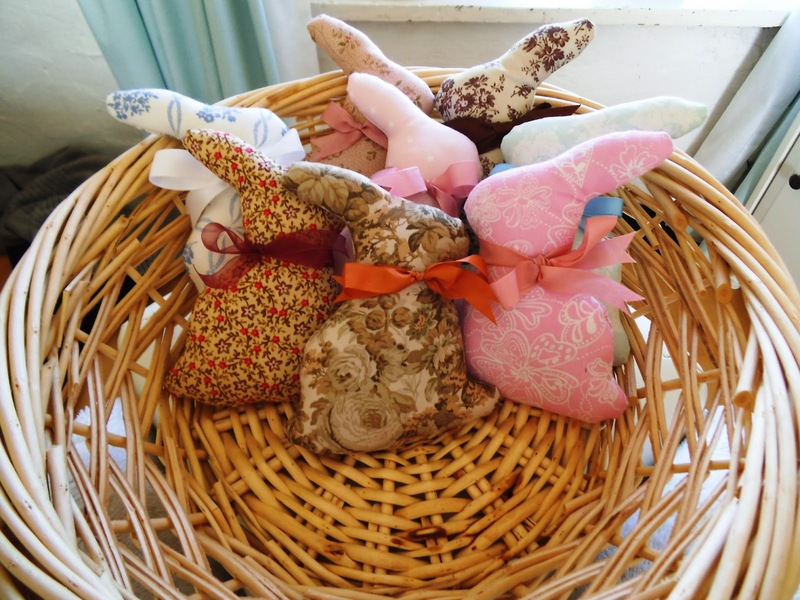 I ADORE your basket of hare pincushions, they are the sweetest things ever! And the Spring ABC is so colourful... in fact, the colours are exactly the same as the bunch of flowers I bought to brighten my flat over Easter. I completely agree with your thoughts about facebook... I find the blog community much more enjoyable, although there are still a few groups that I follow on facebook. However it has become really annoying to me with all the adverts and sponsored posts and to get to the things my friends are saying actually seems very difficult these days. I agree! Although I am on facebook I MUCH prefer blogging and getting to know people through their blog and facebook just isn't the same. I love that sampler you're stitching - well you know I do!